Performance Transmissions & Automotive – Over 30 Years Of Experiance! Over 30 Years Of Experiance! Transmission repair in Modesto CA, by the best in the auto repair industry. Our technicians handle a wide range of transmission repairs and maintenance: everything from fluid changes to complete transmission replacement. At Performance Transmissions and Auto Repair, no problem is too big or too small. We take pride in our Transmission Repair in Modesto Ca. You don’t want your transmission problems to linger – to have to keep going back to a shop and wait until they fix it properly. Avoid a bunch of unnecessary stress and wasted time. When it comes to a critically important component like a transmission, don’t trust your vehicle to anyone but the best. Our technicians are experienced so you can be sure they’ll get it right the first time. With over fourteen years of experience, that’s why we are the transmission repair Modesto CA turns to get it done right. We use high-quality parts, and our experienced technicians are knowledgeable with this kind of work. The Fact is: we’ll get you back on the road with no more transmission difficulties. Call us now and let us become your trusted Modesto Transmission Repair Service. Fluid Leaking? In these cases, you can breathe easy: you might not need a full transmission rebuild. You may only need transmission reseals. Come on in Performance Transmissions and Auto Repair and we’ll get that leak sealed up for you. Let us become your Modesto Transmission Repair Service. We are the transmission repair Modesto CA turns to for clutches. Is your Clutch grinding? If something’s wrong with the clutch on your manual transmission, we can fix it. We’ll put it through a rigorous phase of testing and do all of the necessary repairs to get you back shifting through your gears. Do you feel something unusual while shifting, a popping, shimmying, or rattling? If you know something’s wrong, then you should bring it to Performance Transmissions and Auto Repair. Remember, we are the transmission repair Modesto CA turns to for their auto repair diagnostics. Same deal if your auto won’t shift or won’t stay in the appropriate gear. We are also the transmission repair Modesto CA turns to for Trucks & 4X4 repairs. In fact, they seem to have them more often than smaller cars. This is usually due to the kind of hard use to which they’re subjected: off-roading and towing. But it’s also because they have a larger frame and weigh more. Performance Transmissions and Auto Repair specializes in helping to get those rigs back on the road. Once again, where the transmission repair Modesto CA turns to for Trucks & 4X4 repairs! 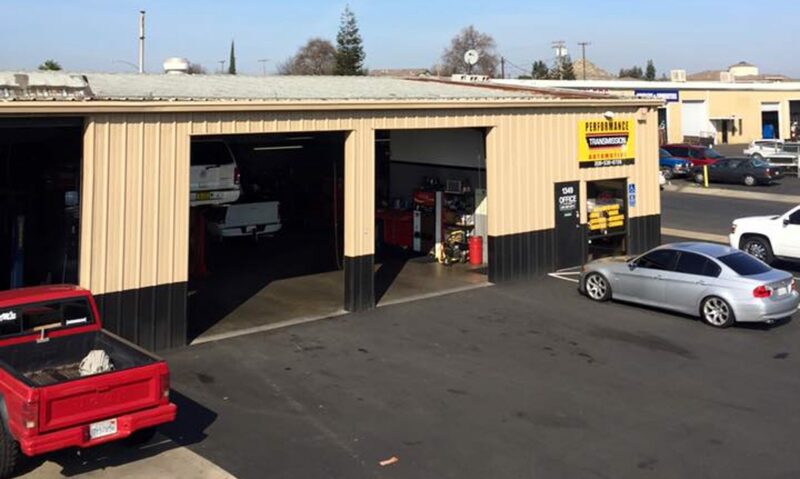 Performance Transmission & Automotive is an auto repair shop in Modesto, CA that specializes in oil changes, tune-ups, transmission repair, and engine diagnostics. Our expert mechanics will get your vehicle back on the road with minimum turn around time. We’ve been locally owned and operated in Modesto for many years. Call Performance Transmission & Automotive today to find out more. At Performance Transmissions and Auto Repair, you will always find a friendly face, great service, and the kind of local Modesto, auto repair service that you have been looking for. We go beyond providing diagnosis and solutions to problems with your car by focusing on customer service. If you need your car repaired quickly and you do not want to worry about it having the same problem again, come to us. We Recommend every two years or every 30,000 miles. This helps reduce emissions and improve performance and fuel mileage. We clean your throttle body area, use induction cleaners to clean the intake manifold area and intake valves, we also clean fuel injectors, install fuel additive to clean the fuel system, to help remove carbon. We check all hoses & belts, pressure test system, check defroster, heater, and cooling fan operation, flush anti-freeze, check for leaks, then road test vehicle. Performance Transmissions auto repair in Ceres Ca does not stop with cooling systems. Performance test of AC, check pressure, check condenser and radiator cooling fan operation, inspect all components for wear, leaks. Evacuate and Recharge the system, then check for leaks. Performance Transmissions auto repair in Ceres Ca does keeps you cool! Remove and inspect brakes, if need be, replace pads or shoes, resurface rotors or drums, inspect brake lines and components, test parking brake. Lubricate caliper slides, and clean the caliper piston. Replace brake any hardware if necessary. Check Brakes, Clean and Adjust – Manufactured Recommended every 15,000 miles or yearly. Complete Road test, inspect pedal height & feel before and after. Remove all wheels & drums. Inspect pads and shoes for wear. Check drums and rotors for excessive heat, inspect rotor and drum run out. Inspect brake hardware that it is functioning properly. Inspect emergency brake operation. Inspect hydraulics, clean brake pads, and brake shoes. Make adjustments to shoes. Install and re-torque wheels to specifications. Check tire pressure, inspect master cylinder & fluid levels. Then road test. We will note brake life percentage on your repair order, check fluid condition for contamination. Brake Fluid Flush – Manufactured Recommendations every two years or 30,000 miles. Extract all contaminated or worn fluid from the brake system and ABS Module, bleed out air from the system, inspect reservoir, fittings, and lines. NOTE: We suggested this with all brake services. Performance Transmissions auto repair in Ceres Ca does not stop with brakes. Power Steering Fluid Services – Recommended every two years or 30,000 miles. Some vehicles may require Platinum (60,000), Copper (30,000), Iridium Plugs (105,000), or Double Platinum (90,000). There are different mileage intervals suggestions with the type of spark plugs that manufacturers require for efficiency.